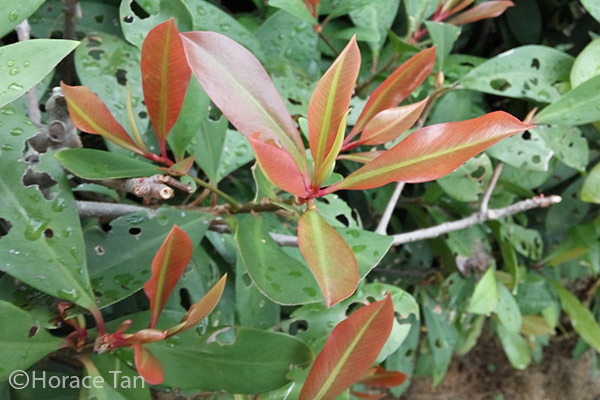 This 11th instalment of our Butterflies' Larval Host Plants series features Ardisia elliptica, a species in Primulaceae (primrose family). 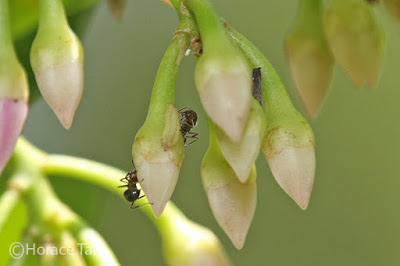 This family of flowering plants has close to 3000 species and include a number of garden plants and wild flowers. The genus Ardisia (coralberry or marlberry) has about 400 odd species which occur in either tree or shrub forms. 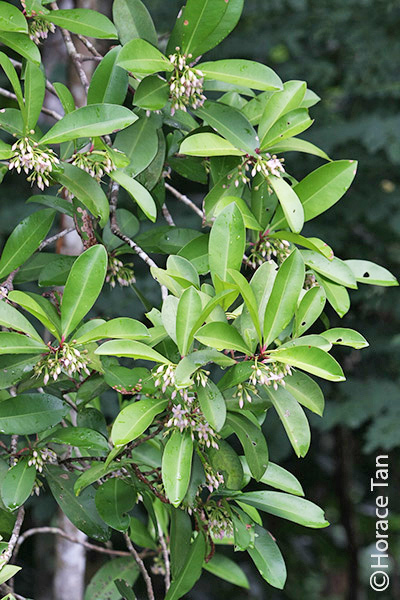 Ardisia elliptica is native to India, Sri Lanka, South East Asia and New Guinea. Over the years, it has been introduced to other tropical regions as ornamental plants. 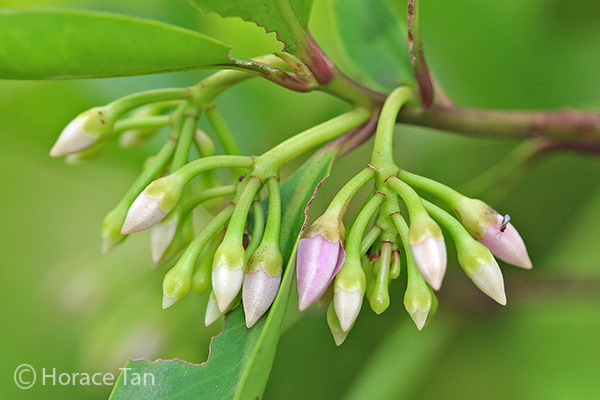 In Singapore, it is readily found as cultivated plants in various parks and gardens. 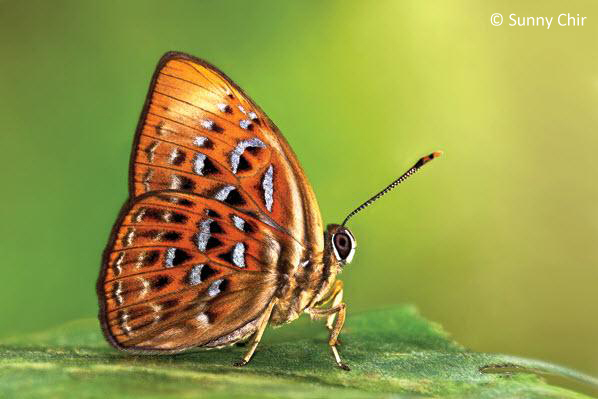 Due to its ability to reproduce prolifically, wild specimens in tidal swamps, nature reserves and wastelands are not uncommon too. 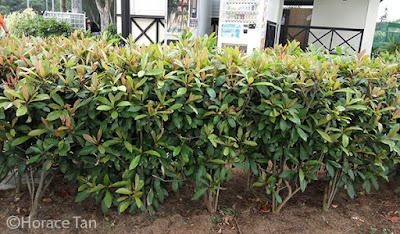 An Ardisia elliptica plant in the Chinese Garden in Jurong. Larval Host for Butterfly Species: Taxila haquinus haquinus (Harlequin), Abisara saturata kausambioides (Malayan Plum Judy), Nacaduba kurava nemana (Transparent Sixline Blue). A row of young Ardisia elliptica plants forming a hedge in Changi coastal park in the east. 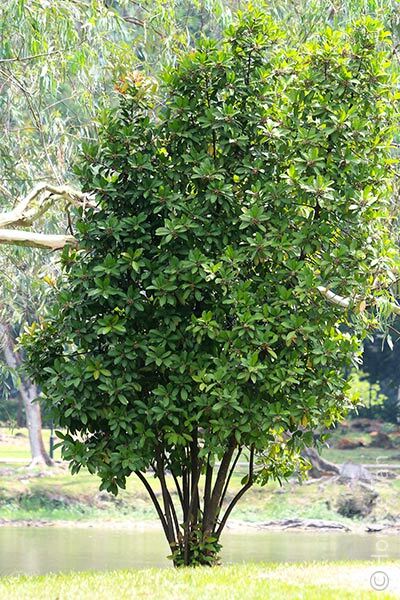 Ardisia elliptica is a understory shrub which can grow up to 5 meters in height. 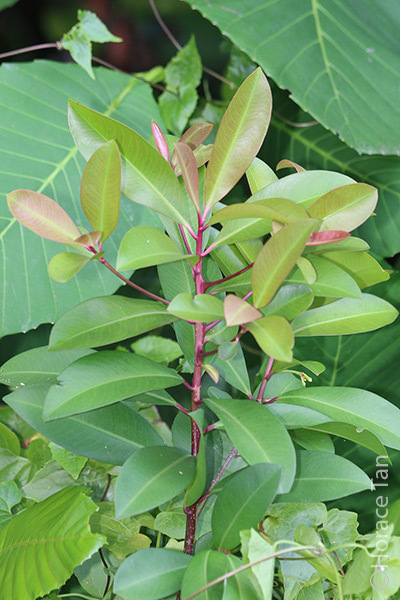 Young stems and petioles are reddish pink in colour. Branches projecting sideways from a stem have leaves arranged on them alternately. Young leaves are reddish pink in colour as well but the coloration fades to reddish brown as it grows. A young sapling of Ardisia elliptica. 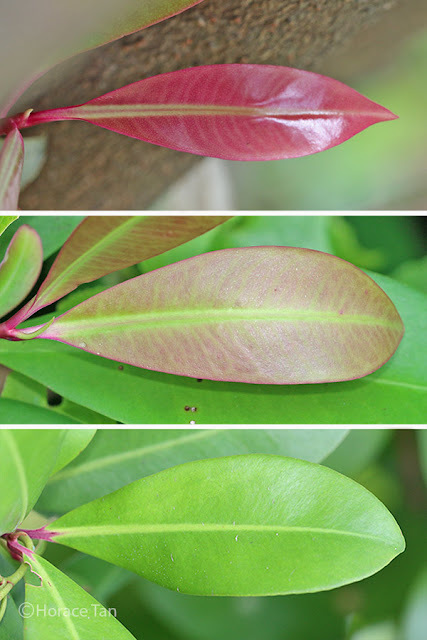 Change in coloration as the leaf of Ardisia elliptica grows and matures. 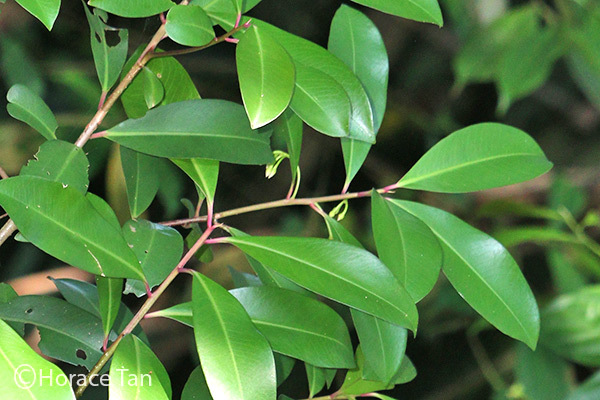 Mature leaves are green, leathery, elliptic to elliptic-obovate in shape and have nearly invisible lateral veins. The leaf margin is entire (that is smooth all the way round). Leaves of Ardisia elliptica have been used medicinally to treat heart pain, scabies and intestinal worms. A small cluster of young leaves of Ardisia elliptica. 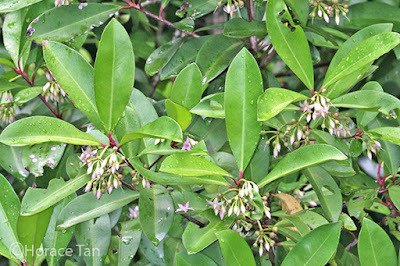 Mature leaves of Ardisia elliptica, note the alternative arrangement of leaves on each branch. Flowers occur in umbellate inflorescences (flower clusters in which stalks of nearly equal length spring from a common centre) which develop in leaf axils. 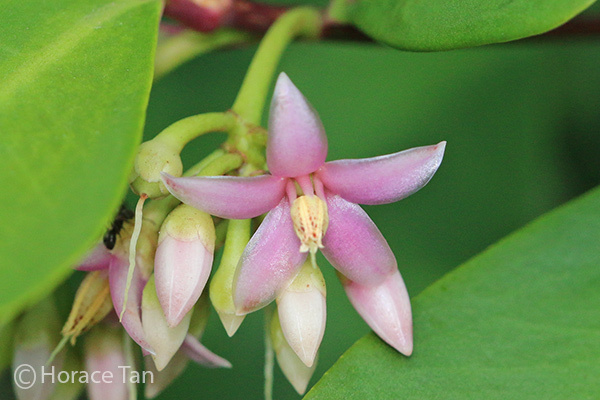 Each of these small, star-shaped flowers has five light pink petals. 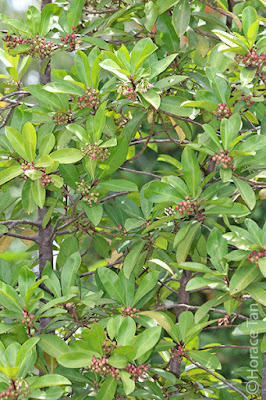 Umbellate inforescences of flower buds. Close up view of a flower of Ardisia elliptica. The small berry-like fruits are roundish, initially green, turning red as they mature and finally deep purple/black when ripened. They are edible but insipid. The single seed within each fruit is approximately spherical. 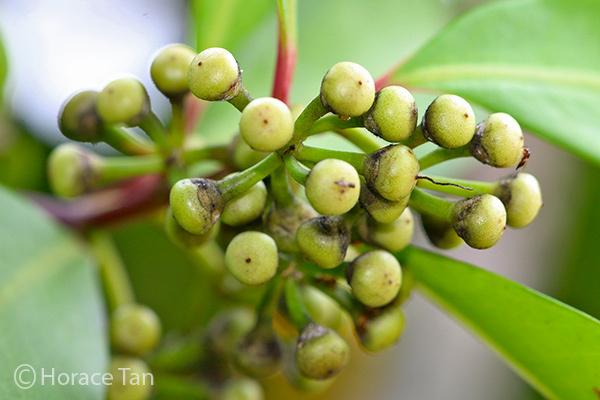 The dispersement of these seeds are aided by fruiting-eating birds. 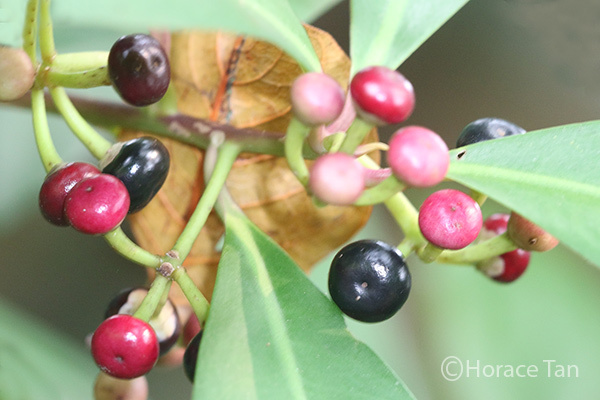 Clusters of young fruits of Ardisia elliptica. Maturing and ripended fruits of Ardisia elliptica. 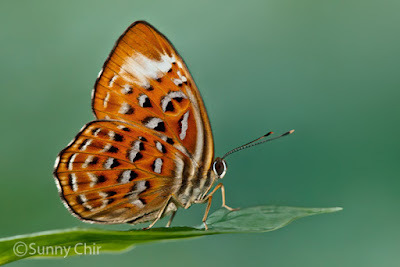 In Singapore, Ardisia elliptica also serves as the larval host plant for three butterfly species: Harlequin, Malayan Plum Judy and Transparent Sixline Blue. 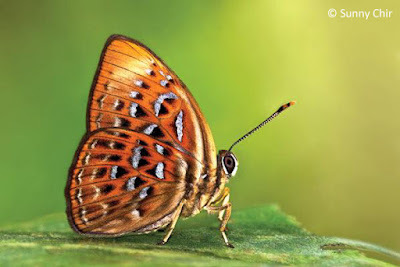 The first two are riodinid butterflies, while the last one is a lycaenid. 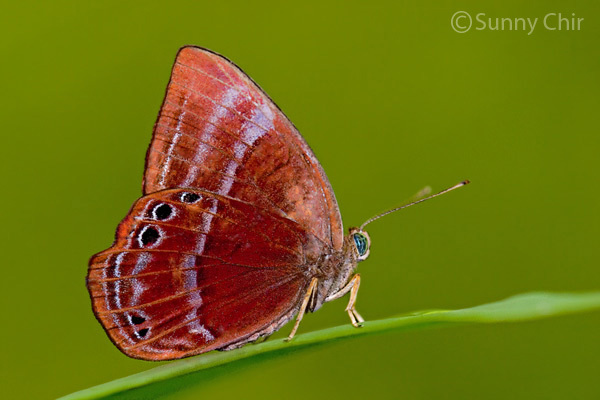 A female Malayan Plum Judy. 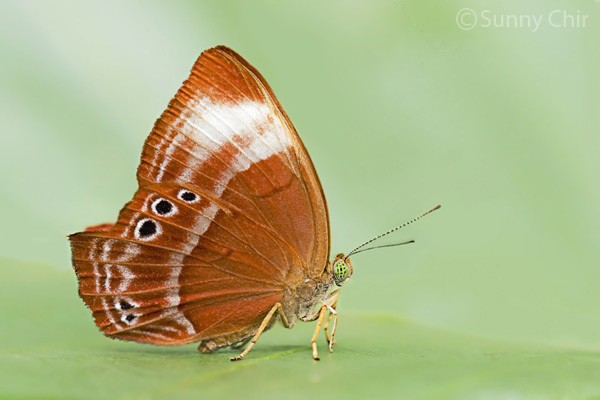 A male Malayan Plum Judy. 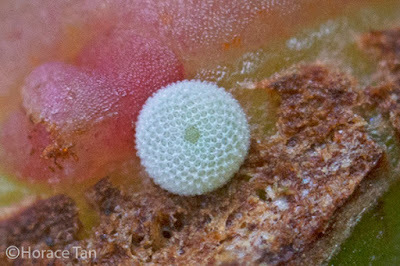 Eggs of both Harlequin and Malayan Plum Judy are laid singly on leaf surface, typically on the underside. 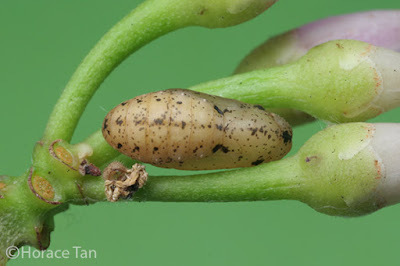 In contrast, eggs of the Transparent Sixline Blue are laid singly on young shoots and sometimes on the pedicel of a flower. 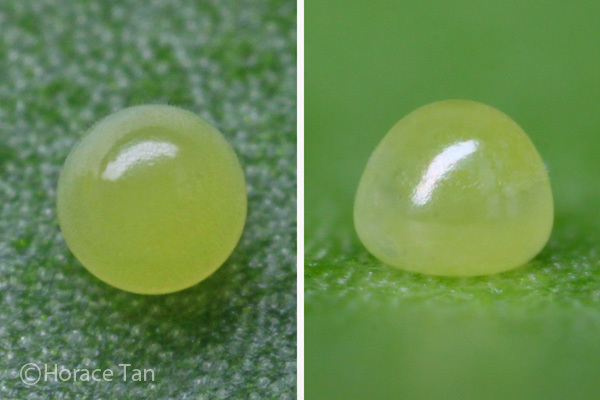 Two views of an egg of the Malayan Plum Judy. Two views of an egg of the Harlequin. 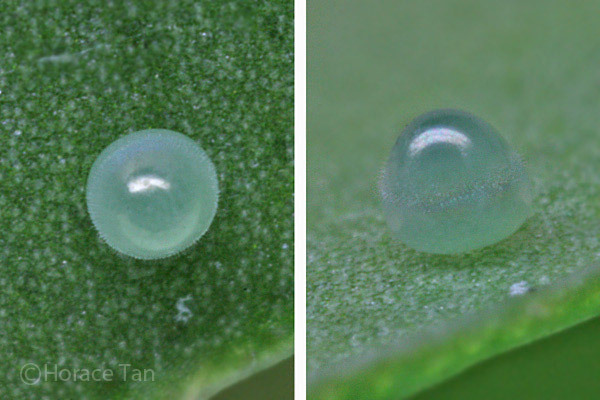 An egg of the Transparent Sixline Blue laid on a young shoot of Ardisia elliptica. Caterpillars of the Harlequin and Malayan Plum Judy feed on both developing and mature leaves of Ardisia ellitica while those of the Transparent Sixline Blue feed mainly on flower buds, often with ants in attendance. A caterpillar of the Transparent Sixline Blue feeding on a flower bud of Ardisia elliptica in the presence of two ants. An empty egg shell can be seen near the base of the pedicel. 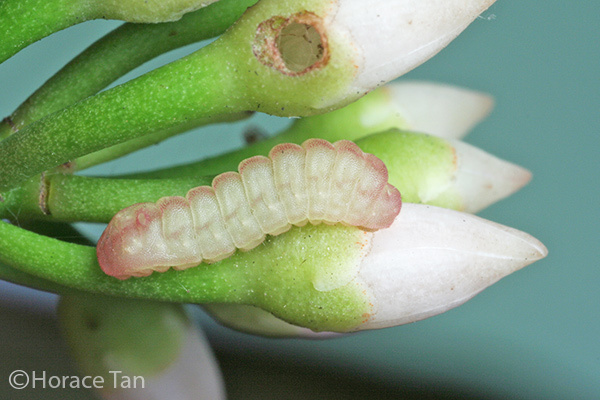 A final instar caterpillar of the Transparent Sixline Blue feeding on a flower bud of Ardisia elliptica. 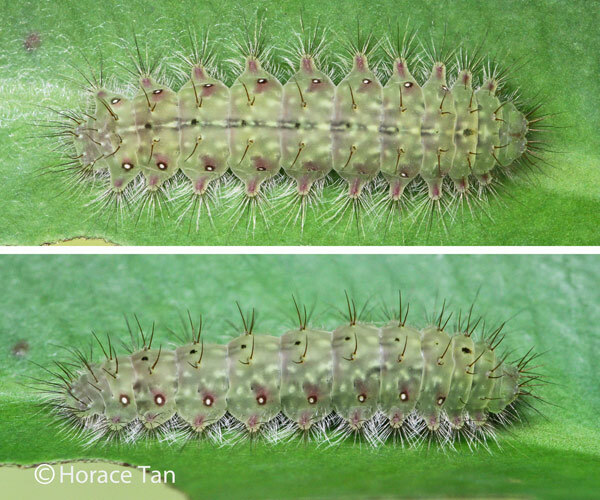 Two views of a final instar caterpillar of the Malayan Plum Judy. 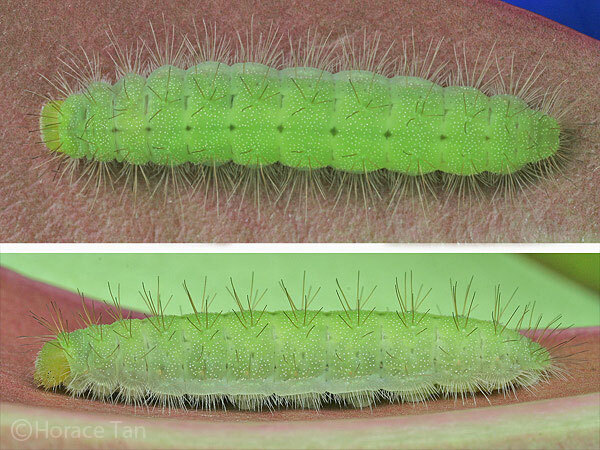 Two views of a final instar caterpillar of the Harlequin. Caterpillars of the Harlequin and Malayan Plum Judy both choose to pupate on the underside of a leaf. 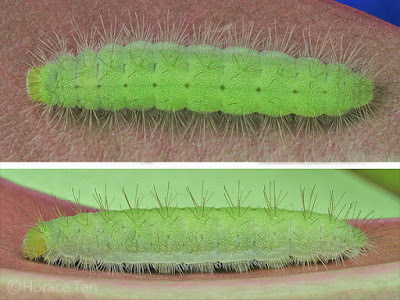 Their pupae are secured via a silk girdle as well as cremastral attachment to a silk pad on the leaf surface. They have close resemblance but those of the Harlequin have reddish brown markings not found in those of the Malayan Plum Judy. 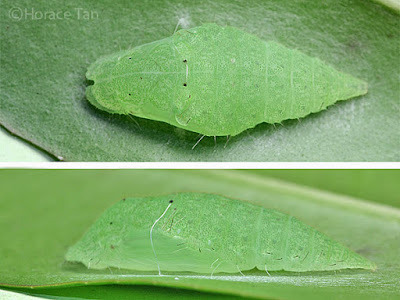 Two views of a pupa of the Malayan Plum Judy. The pupae of the Transparent Sixline Blue have the typical lycaenid shape, pale brownish with black spots. They are also secured via silk girdle and cremastral attachment. 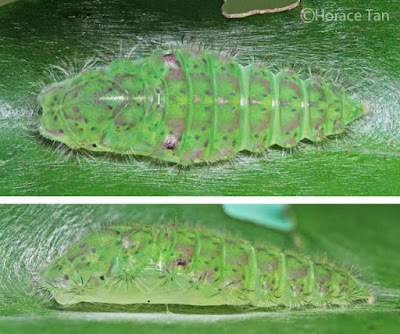 A pupa of the Transparent Sixline Blue. Wild Singapore - Mata pelandok or Seashore ardisia. DNA, Lee Kong Chian Natural History Museum - Ardisia elliptica. Text by Horace Tan, Photos by Sunny Chir, Khew SK and Horace Tan.